The Avengers fought each other on Jimmy Kimmel Live earlier this week but without the usual explosions and special effects. 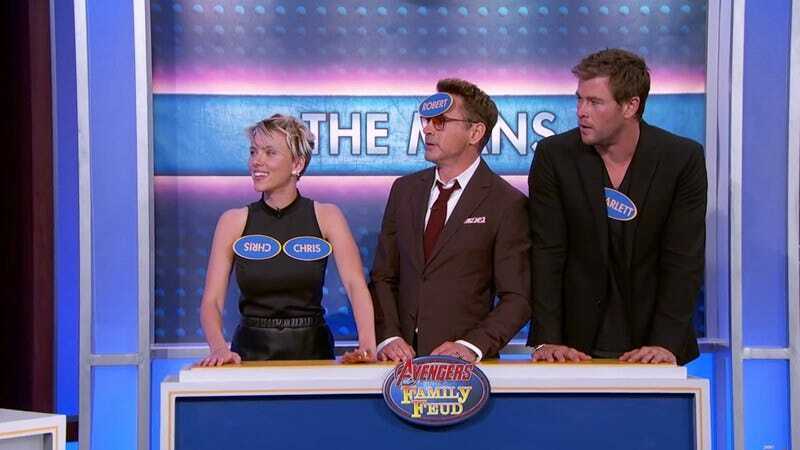 Under the team name “The Americans” (no affiliation with Keri Russell’s hair), Age Of Ultron cast members Chris Evans, Jeremy Renner, and Mark Ruffalo faced “The Mans”—Robert Downey Jr., Chris Hemsworth, and Scarlett Johansson—in a game of Family Feud. The catch? A lot of tequila. The superactors definitely are not in the zone for this game: A very unsure Hemsworth offers up “Peter Pan?” as an example of another profession besides “superhero” that requires tights. But the poor play is probably a result of the players’ general drunkenness, and to be fair, Kimmel is as bad of a game show host as they are as contestants. Even Ruffalo gets stumped on “worst places to turn into the Hulk.” Come on, Mark! Telephone booths aren’t even a thing anymore!